Maurice Baring was a diplomat, Royal Air Force officer, and an elder statesman of English letters in the early twentieth century, who was accomplished in many literary forms, including poetry, drama, journalism, fiction, critical essays, and learned literary spoofs. He was a world traveler, spending time working for the Foreign Office and later as an international correspondent for The Times and The Morning Post. In his life he wrote over fifty books, countless articles and news pieces, a number of poems, and numerous essays. Nevertheless, this veritable giant of his age is barely known today. The works of Baring remain remarkably obscure and it seems that they are all but forgotten. It would seem somewhat appropriate then that despite his grandeur, and close association with Belloc and Chesterton, the John J. Burns Library’s British Catholic Authors Collection has only scant material on Baring. Baring was born April 27, 1874, in London, into an aristocratic English family and banking dynasty (of the famous Barings Bank). He was the son of the first Lord Revelstoke, and attended Eton School and Trinity College, Cambridge, though he left Cambridge in 1894 without taking a degree. His ability in languages–he was fluent in eight languages–led him to take a job with the Foreign Office at the age of 24. While in the diplomatic service he served as attaché in Paris, Copenhagen, and Rome, and worked for a year in London. During his years abroad he enjoyed the company of various social circles, which enriched his appreciation of the arts and broadened his view of European politics. These experiences shaped the cultural milieu that would set the background for many of his works. In 1904 he left diplomacy to become a foreign correspondent for the London Morning Post, first covering the Russo-Japanese War in Manchuria, and then in St. Petersburg where he chose to stay until 1909, as he had grown enamored with the Russian culture and people. In 1909 he moved to Constantinople where he worked for the London Times covering the Balkan Wars. In the same year he converted to Catholicism, and he later described this decision as “the only action in my life which I am quite certain I have never regretted.” During the First World War he became a staff officer of the Royal Air Force, and was later appointed OBE (Officer of the Order of the British Empire). His experiences during the First World War were recorded in his memoir, Flying Corps Headquarters 1914-1918 (1920). Likewise, the entirety of this early period of Baring’s life is documented in his autobiography, The Puppet Show of Memory (1922). The title page from Baring’s autobiography, The Puppet Show of Memory. 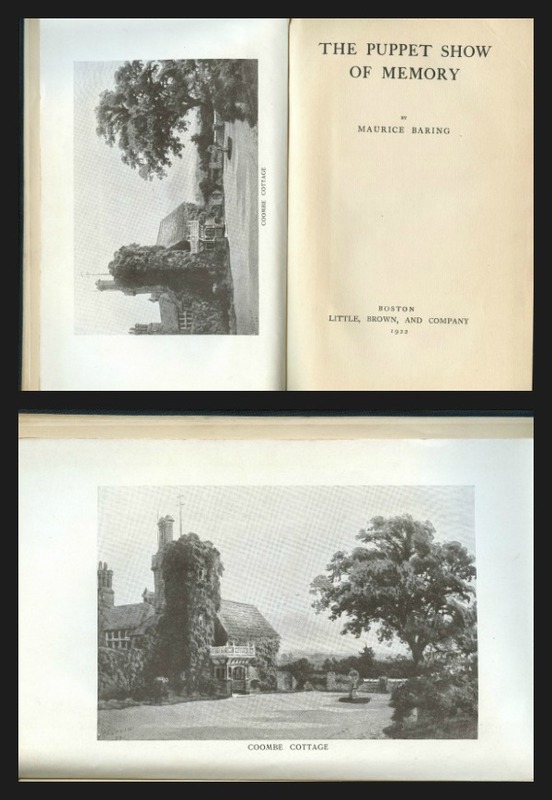 The left page has been turned and enlarged below the image to offer greater detail. British Catholic Authors Collection, PR6003.A67 .Z53 1922b BRITISH CATHOLIC AUTHORS, John J. Burns Library, Boston College. After World War I Baring wrote several poems in honor of the friends he lost in the war. The most famous of these poems was “In Memoriam: Auberon Herbert, Captain Lord Lucas, Royal Flying Corps, Killed November 3, 1916.” With the exception of these verses and a biography of Sarah Bernhardt, Baring turned to writing novels after the war, and between 1921 and 1935 he published thirteen novels, the most famous of which are C (1924), Cat’s Cradle (1925), and Daphne Adeane (1926). In these novels, Baring promoted the image of the stoic Russian spirit while focusing on the “travails that hide beneath the veneer of social propriety, and moral dilemmas that are resolved only through resignation and loss”. Of Baring’s large oeuvre of around fifty books, his novels have remained the most popular. Baring was a close friend of Hilaire Belloc and G. K. Chesterton, and it has been suggested that Baring was the model for Horne Fisher, the connecting character of the stories that compose Chesterton’s The Man Who Knew Too Much (1922). Towards the end of his life he involved himself in a literary correspondence with the author Enid Bagnold (Lady Jones), in which he advised her on her literary work, as they casually discussed the craft of writing. In 1936 he was diagnosed with Parkinson’s disease, and he spent the last part of his life as the guest of Lord Lovat at Beaufort Castle, Beauly, Inverness-shire, Scotland. He died there on December 14, 1945. One of the many correspondences between Maurice Baring. While it is of a more personal nature, they span a variety of topics and purposes. They are arranged chronologically in our collection. Maurice Baring Collection, MS2006-34, Box 1, Folder 9, John J. Burns Library, Boston College. The Maurice Baring Papers is a collection of four Baring acquisitions by the Burns Library and consists of correspondence, a single handwritten manuscript, and ephemera written by and concerning Maurice Baring. The collection dates from 1920 to 1963; most of the documents are letters by Baring to the writer Enid Bagnold, otherwise known as Lady Jones, written between 1931 and 1943. 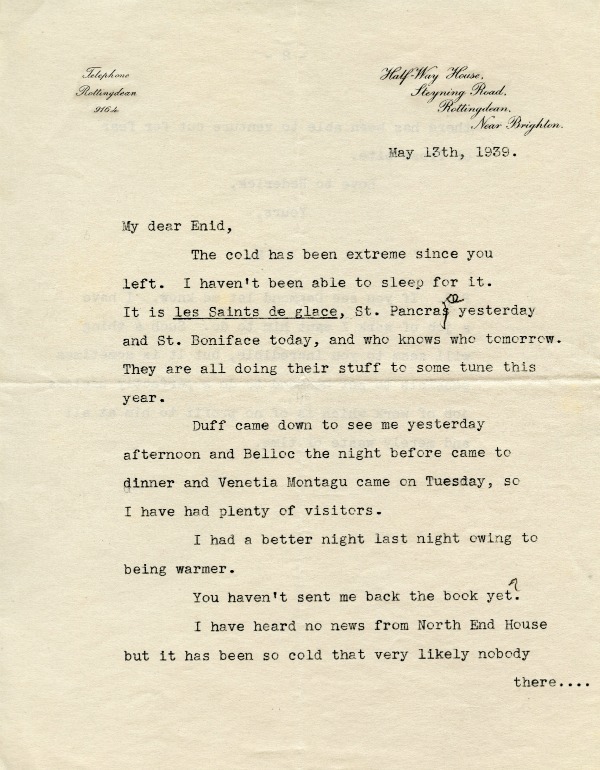 There are also letters from Baring to Gerald Gould, James Pond, Edward Shanks, S. K. Ratcliffe, and Leslie Chaundy. There are letters from 1963 between Bagnold and Julian Jeffs concerning Baring’s letters to Bagnold. Various letters of this collection mention meetings with Noel Coward, Desmond MacCarthy, Hilaire Belloc, and Virginia Woolf. 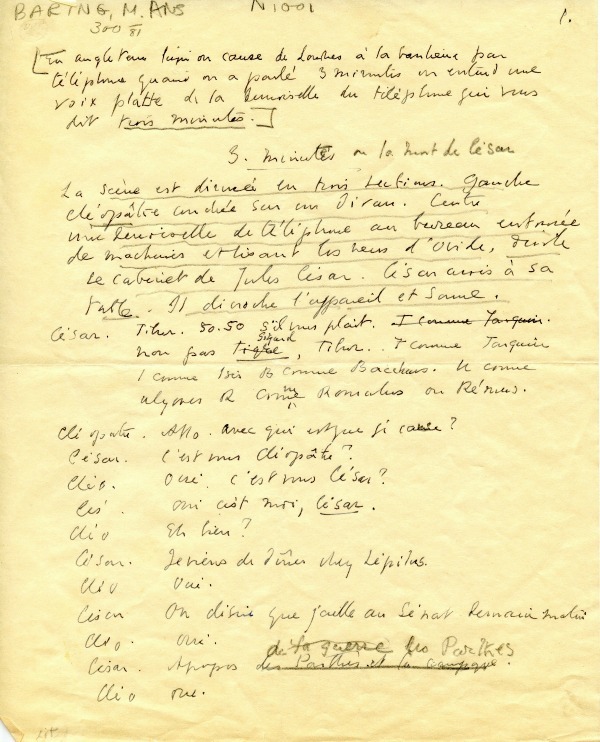 A short handwritten manuscript in French by Baring entitled Three Minutes, or the Death of Caesar; a copy of The Order for the Burial of the Dead; and a typed storage list of Baring’s things dated December 9, 1942 complete the collection. The digital finding aid for this collection can be found online here. A hand written and autographed manuscript of Three Minutes, or the Death of Caesar in French, the only manuscript by Baring in our collection. MS2006-34, Box 1, Folder 21, John J. Burns Library, Boston College. Cisco, Michael. “Maurice Baring.” Contemporary Authors Online. Detroit: Gale, 2007. Biography in Context. Web. 30 June 2015. Downing, Ben. “Baring’s collapse.” New Criterion 26.8 (2008): 65+. Biography in Context. Web. 30 June 2015. This entry was posted in Archives & Manuscripts, British Catholic Authors, Featured Collections & Books, Staff Posts and tagged boston college, british catholic authors, Burns blog, burns blog boston college, burns library blog, john j. burns library blog, maurice baring. Bookmark the permalink.